Zone-Reflex: Could antimatter be the missing darkmatter? Kea has some really interesting thoughts on her blog. Given the bound beta decay n→H+ν¯ and its presumably similar looking antimatter reaction, we can conclude that anti-hydrogen will not look exactly like hydrogen. That is, (i) the Particle Data Group informs us of mass differences between neutrons and anti-neutrons and (ii) we know about the mass differences between neutrinos and antineutrinos. The fission of mercury-180 was expected to be a symmetric reaction that would result in two equal fragments, but instead produced two nuclei with quite different masses, two distinct peaks centred around the nuclei ruthenium-100 and krypton-80, an asymmetric reaction. Some fission reactions are asymmetric, including many of those of uranium and its neighbouring actinide elements. These instead can be understood by also using the shell model, in which unequal fragments can be preferentially created if one or both of these fragments contains a "magic" number of protons and/or neutrons. For example, one of the fragments produced in many of the fission reactions involving actinides is tin-132, which is a "doubly-magic" nucleus, containing 50 protons and 82 neutrons. Neutrons? What are their messages? Magic numbers? - The observed fragments do not contain any magic or semi-magic shells, but 80:100 (4:5). Fission isn't magic, but stability is? CERN's ISOLDE radioactive beam facility, investigated the interplay between the macroscopic and microscopic components of nuclear fission. It used what is known as beta-delayed fission, a two-step process in which a parent nucleus beta decays and then the daughter nucleus undergoes fission if it is created in a highly excited state. This kind of reaction allows scientists to study fission reactions in relatively exotic nuclei. Firing a proton beam at a uranium target and then using laser beams and a magnetic field to filter out ions of thallium-180 from among the wide variety of nuclei produced in the proton collisions. These ions then became implanted in a carbon foil, where they underwent beta decay and some of the resulting atoms of mercury-180 then fissioned. The analysis: Search for Stopped Gluinos in pp collisions at sqrt s = 7 TeV. Analysis of a gluino, which is the gluon’s supersymmetric cousin. The gluino force. 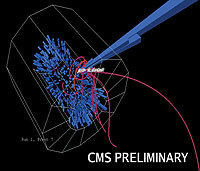 A gluino that decays inside the CMS calorimeter will leave a single blob of energy (big blue spike) with very little in the rest of the detector. Interaction of the strong force, QCD, on weak perturbation theory, QED? Strong force force to asymmetry? Antimatter and matter have differencies in the strong force, hence wavelength too. As if this weren’t exotic enough, this analysis looked for very long-lived gluinos, potentially existing for more than 15 minutes. In a field in which a lifetime of a millionth of a second is a long time, 15 minutes might as well be forever. A frosen force? Time is making the asymmetry? Usually antimatter is said to go to the past. This is how it could happen? This antimatter is then also turned dark? A necessary feature of supersymmetric theories is that they predict that for all known subatomic particles, each particle should have a supersymmetric cousin, which differs in the details of how the particles spin. Is time a spin feature? Is antimatter about spin? The concept of "magic numbers" in nuclei. The nuclear shell model, which was first proposed in 1949, explains that nuclei with certain magic numbers of neutrons and/or protons are especially stable because the neutrons and/or protons form closed shells. Nuclei that contain magic numbers of both protons and neutrons are even more stable and are said to be "doubly magic". Silicon-42 is very close to the limit of (hierarchial) nuclear existence. The silicon-42 nucleus remains stable despite containing a large excess of neutrons. The data also suggest that the proton number 14 is semi-magic because it corresponds to a closed subshell, which means large s-wave probability and the nucleus is also spherical. Whether the major shell closures and magic numbers change in very neutron-rich nuclei (potentially causing shape deformations) is a fundamental, and at present open, question. The stable nuclides are shaded. The nuclei studied here—42Si, 43P and 44S—are circled. N, number of neutrons; Z, number of protons. Table of nuclides. Also the recent As instead of P can be seen as an hierarchial form of Life? This brings into mind the islands of stability, protons:neutrons, and the hierarchial problem. Energy loss : time? Islands of Life, what axes do it use? Varying, says Quantitative Habitability Theory. The C:O axis? Life as islands of rational/algebraic numbers in TGD. The mass gap, shell gap? Mass is not fundamental, but derived. There is currently no understanding of the way space-time could be reduced. Living matter has taken another path than ordinary matter?(a.k.a. Mysteries of Life). There are two entirely different mass scales, Planck scale and electroweak scale, how can these particles be so light? Some models are here. The nuclei with Z=120, 124, 126 and N=184 are predicted to form spherical doubly-magic nuclei and be stable with respect to fission. Neutron-rich and doubly magic,The existence of a new ‘doubly magic’ nucleus found with an unconventional configuration of neutrons. The oxygen–24 nucleus is also the first doubly-magic nucleus that is very unstable against radioactive decay. Could shed light on neutron-rich environments such as neutron stars and supernovae. ...protons and neutrons in nuclei occupy discrete orbitals — in much the same way as electrons do in atoms. Magic nuclei are those having the precise number of protons or neutrons required to fill a spherical set of related orbitals called a ‘shell’. Nuclei with magic neutron or proton numbers are characterized by a stronger binding, greater stability, and, therefore, are more abundant in nature. In doubly magic nuclei, both proton and neutron shells are filled, making the binding even stronger. “It’s thanks to the doubly magic numbers that nuclei such as oxygen and calcium are abundant making it possible for us to exist on earth.” They form benchmark points for the nuclear shell model. The magic numbers in stable nuclei — which have similar numbers of protons and neutrons and don’t undergo radioactive decay — are known to be 2, 8, 20, 28, 50, 82 and 126. However, less is known about magic numbers in unstable nuclei in which the ratio of neutrons to protons is significantly greater. Showed how the orbitals are arranged within the nucleus. The results confirmed that the arrangement was spherically symmetric — a hallmark of doubly magic nuclei- one conventional magic number (8 protons) and an unconventional magic number (16 neutrons). “Our world-wide collective effort to understand the physics behind the extremes of our universe is bringing many pieces of the puzzle together slowly.” Twice as many neutrons as protons. Oliver K. Manuel: All n-p interactions are strongly attractive inside the nucleus. These are accompanied by repulsive and symmetric n-n and p-p interactions that are made even more repulsive by interactions between the + charges on protons for the p-p interactions. In 2000 it was first discovered that repulsive forces between neutrons are dominant in all neutron-rich nuclei. The Ice Cube, a neutrino telescope under construction at the South Pole, may test the [hypothetical] hypothesis of the gravitational repulsion between matter and antimatter. If there is such a gravitational repulsion, the gravitational field, deep inside the horizon of a black hole, might create neutrino-antineutrino pairs from the quantum vacuum. While neutrinos must stay confined inside the horizon, the antineutrinos should be violently ejected. Hence, a black hole (made from matter) should behave as a point-like source of antineutrinos. Our simplified calculations suggest, that the antineutrinos emitted by supermassive black holes in the centre of the Milky Way and Andromeda Galaxy, could be detected at the Ice Cube. In our Universe dominated by matter, the miniscule quantities of antimatter could not have any significant impact on gravity. However this naïf point of view neglects the physical vacuum, in which virtual matter and antimatter “appear” in equal quantities according to Quantum Field Theory (QFT),. Hence, the gravitational mass of the quantum vacuum (and thus the fate of the Universe) depends on the gravitational properties of antimatter. A gravitational field, sufficiently strong to create particle-antiparticle pairs, could exist only deep inside the horizon of a black hole. An immediate consequence is that if (for instance) a black hole is made from ordinary matter, produced particles must stay confined inside the horizon, while antiparticles should be violently ejected because of the gravitational repulsion. Non-thermal radiation of black holes may exist even if there is no antigravity. Imagine that there is a still undiscovered interaction, repulsion between matter and antimatter, with the following features: (a) The new force acts, between particles having an appropriate “charge”, which (just as the electric charge) can be positive or negative. In order to be definite, a positive “charge” is attributed to matter and a negative one to antimatter. (b) There is an attractive force between “charges” of the same sign, and a repulsive force between “charges” of different sign. This is just opposite to the familiar case of electric charges. (c) The assumed repulsion between particles and antiparticles is stronger than the gravitational attraction between them. (d) It may be a force with much shorter range of interaction than gravitation. Such a new force is less elegant possibility than antigravity but it is evident that it can produce particle-antiparticle pairs according to equation. Pauli has done great things even when it comes to antimatter - such as a proof of the CPT-theorem that links the properties of antimatter in the mirror to the properties of matter that moves backward in time. Magnetic monopoles comes into mind. When a charged particle is brought close to the surface of a topological insulator, a magnetic monopole charge is induced as a mirror image of the electric charge. Quasiparticles as axions, anyons etc. which goes through zero. The electro-magnetic polarization θ(x)/2π oscillate = ±1/2 determined by the direction of the surface magnetization. Consider the geometry, a complete boundary value problem. (q = (θ/2π)g derived by Witten, 1979). A 2D electron gas in the neighborhood of the surface will becomes a “dyon” gas with fractional statistics. Exotic particles such as the magnetic monopole, dyon, anyon, and the axion have played fundamental roles in our theoretical understanding of quantum physics. Let us assume in the lower half space the electric field is given by an effective point charge q/ǫ1 and an image charge q1 at (0, 0, d), whereas the magnetic field is given by an image magnetic monopole g1 at (0, 0, d). In the upper half space the electric field is given by an electric charge q/ǫ1 at (0, 0, d) and an image charge q2 at (0, 0,−d), the magnetic field is given by an image magnetic monopole g2 at (0, 0,−d). It is easily seen that the above ansatz satisfies the Maxwell’s equation on each side of the boundary. At the boundary z = 0 shows that for an electric charge near the surface of a topological insulator, both an image magnetic monopole and an image electric charge will be induced.